One of the most common medical condition associated with Down syndrome is a congenital heart defect. We talk about this and a few other conditions in Four Medical Concerns For Babies Born with Down Syndrome but we wanted to take a special look at the heart and share a friend’s experience. Up to 50% of children with Down syndrome can also have a heart condition. When we first were told that Noah had Down syndrome I remember clutching my chest and asking how was his heart. On his exam his heart sounded great and they didn’t hear a murmur. The next day he was seen by a cardiologist who did an echo and discovered he had an atrial septal defect (ASD) and a parent ductus arteriosus. 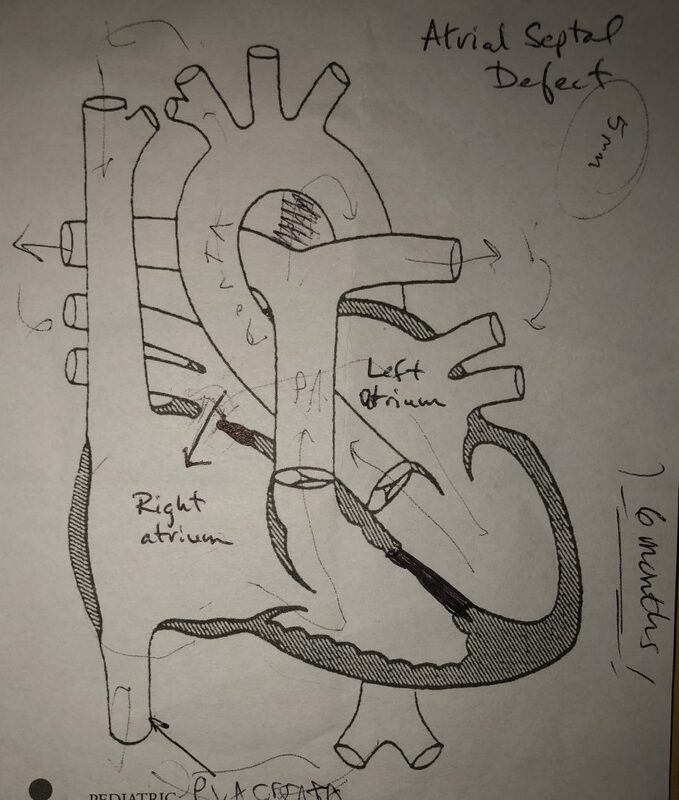 We still have the drawing that was made for us (cardiologist love to draw pictures as it is much easier to explain with a visual). This is one reason as a pediatrician I recommend all newborns with DS get an echocardiogram, you can see nothing on your prenatal ultrasounds and the heart can sound perfect but there could be a defect present that requires monitoring. Noah was monitored every 6 months initially and is now watched every 2 years. His ASD has gotten smaller but has not closed. There is a good chance it will never close but they don’t anticipate it causing any issues for Noah. At 2 months of age we were told that his PDA was closed, however he did so well with his echo (thanks to the wonders of tv) at the age of 2 that they discovered it was actually still open. Thankfully neither one of these defects are causing any concern for our cardiologist and we will just continue to go in routinely for our follow up appointments. We have been blessed to know several friends in our area who have Down syndrome, many of whom have had heart surgery. One of these families are dear friends of ours. Our boys with DS are very close in age and actually look very similar but their journeys have been quite different. He has battled through some surgeries like a true warrior and is thriving. 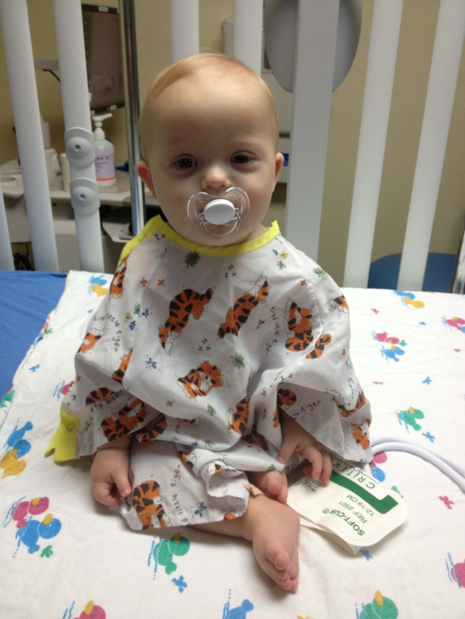 We asked his parents to share their surgery story with us to help others know know a glimmer of what to expect. After a prenatal diagnosis of Down Syndrome and an enlarged kidney, my mind was already pretty numb by the time I heard heart defect. Trying to comprehend all of these diagnoses was overshadowing the most important fact, I was pregnant with a precious little boy. 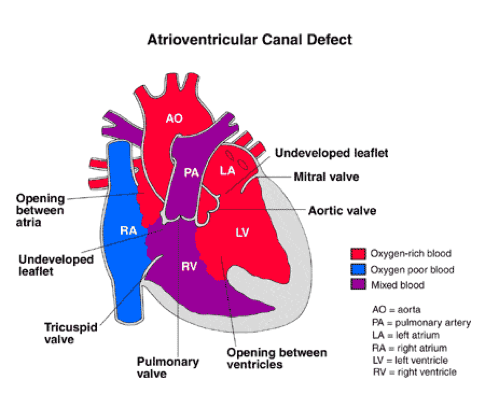 Around 50% of babies that have Down Syndrome are born with some type of heart defect, AV canal being the most common. 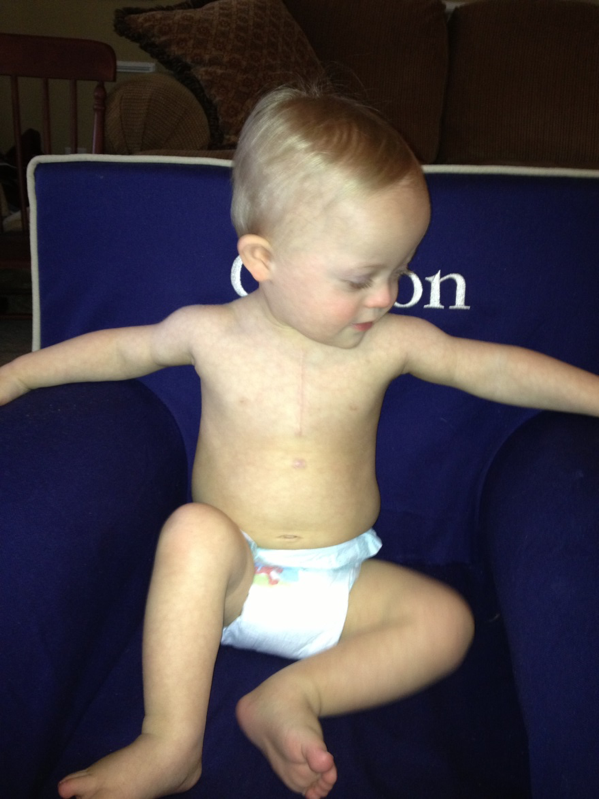 Carson had a complete AV canal defect, meaning he essentially had a two chamber heart instead of a four chamber heart. 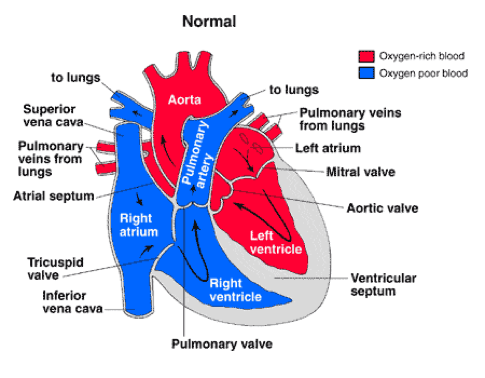 This would mean that the good and bad oxygen would mix, eventually leading to congestive heart failure. We were told that after he was born he would probably need to be on heart medication after a few weeks because he would start going into congestive heart failure and around 4-6 months he would need heart surgery to fix his AV canal defect. 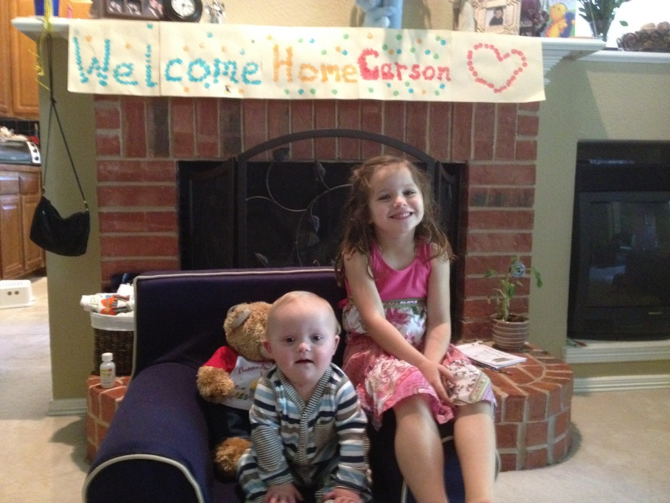 On August 1, 2011, (6 weeks early) our adorable blonde hair, blue eyed , Carson was born. He looked like a perfectly healthy little angel to me. He continued to prove everyone wrong by not needing oxygen after his second day in the NICU and was eating like a champ and released after 20 days with no signs of heart failure. His oxygen levels hovered around 85 and we noticed he was sleepy and wore out pretty easily, but for the most part he was like any other baby. After another appointment with the cardiologist we found out the AV canal less severe as originally anticipated from the fetal echo and we could postpone surgery until he was a year old. On August 15, 2012, the day was finally here where they would repair his heart. He would have his AV canal repaired, close his PDA, and fix a leaky mitral valve. I will be honest it was the scariest thing I have ever been through. Keep in mind Carson had a complication that is pretty rare. I read so many blogs to prepare myself and it did help some, but nothing can fully prepare you for seeing your child hooked up to so many machines and drips. I think the best thing was talking to families who have been through similar events and letting them give you advice. I am so thankful for my faith, family, and friends that got us through it. After a 4-5 hours in surgery my mom intuition kicked in and I knew something was wrong. It was taking too long and the updates from the nurse were getting more and more vague. Finally the doctor came out and talked with us. After taking him off of bypass the first time they noticed his Mitral Valve still had a slight leak so they went back in. After repairing the valve and coming back off of bypass for a second time, half of Carson’s heart was not pumping. 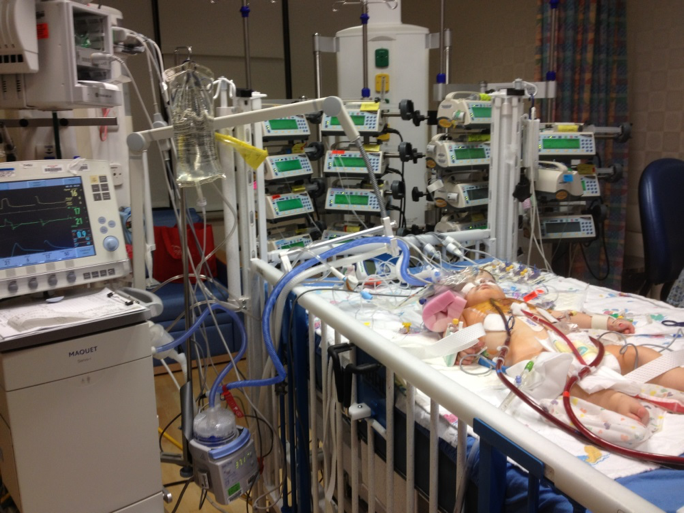 Carson was put on ECMO (Extracorporeal Membrane Oxygenation ) machine and his sternum was left open (yep, did not prepare for that). I am so glad at the time I had no clue what this was because I was already scared to death. After a few scary middle of the night calls from the NICU nurses and his surgeon, Carson decided to beat odds again and his heart started beating on its own. Within a few days his sternum was closed, he was weaned off of most of the drips and 7 days after a pretty traumatic surgery we were home and he was almost back to himself. What a blessing it is that modern medicine can fix these little guys hearts. While it remains the scariest week of my life, I also know it is what saved his life. My little angel is still here today because a wonderful surgeon was able to repair his heart. He now has a perfectly healthy heart and his oxygen is at 100%! And boy does it show, he has gone non-stop since his heart surgery and is full of energy. We are now approaching almost a year since his heart surgery and you can barely even see the scar that saved his life. 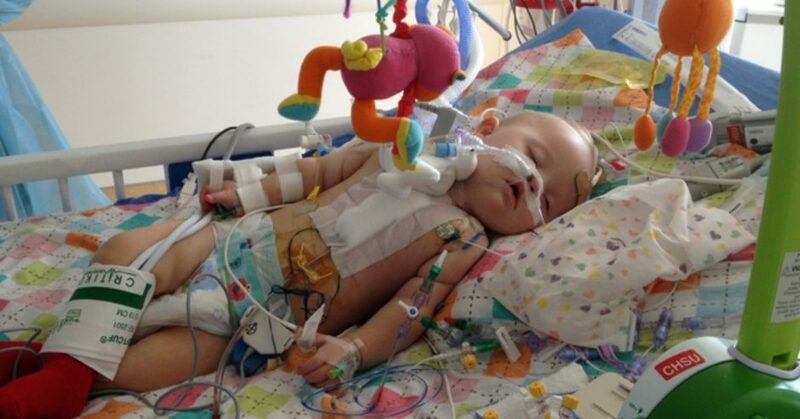 Do have a child with a heart defect, or have had a surgery? Leave a comment below and share your story! If you’re looking to meet other parents of children with heart defects check out this Facebook group. My name is Debbie we live in Edinburgh Scotland. I was during my 12 week scan they checked the neck measurement of the baby and confirmed the measurements were high and there was a 1 in 5 chance the baby I was carrying would have down syndrome! She then said ‘I’m so sorry’. I cried so hard on the bus to work – i just kept tthinking if they are apologising it must be bad. Cammy was born on 18 March 2015 weighing 8lb 4oz via a csection. He wasn’t able to breath on his own so was taken into neonatal unit – I got to see him briefly before he went! I was able to see him when ever i wanted – which was great for his big brother Connor and big sister Chloe! In fact they went to see him before i was able to – when I did get to see him once of the nurses said here’s Cammy Whammys mum a nickname his sister had given him already. We left hospital when cammy was 6days old but he was struggling to breath so at 8days old we went into hospital again but we’re discharged 5days later. 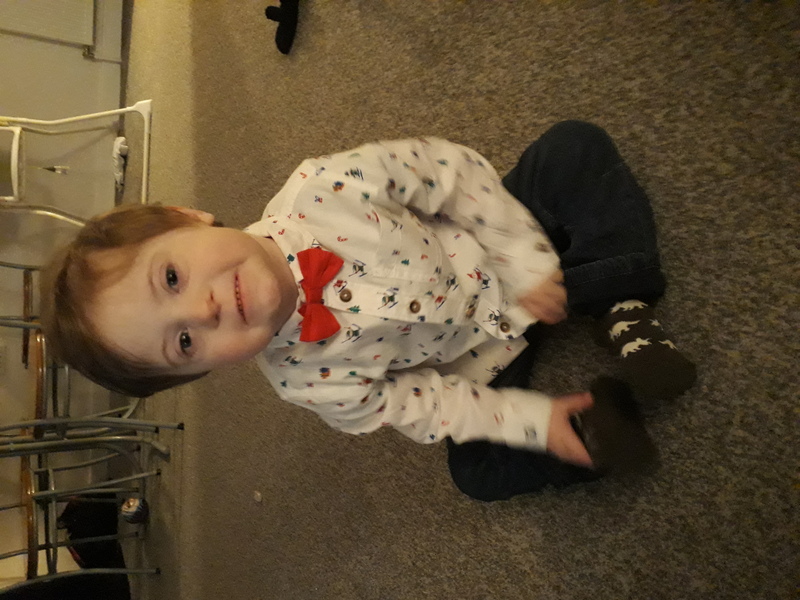 We had appointments with the cardiologist every wk to make sure his wee heart was coping ok – it seemed to be going when he was 3 months we were told they thought there was only one hole and not two so he wouldn’t need an op until he was 18months which was a relief. We got an appointment to go through to Glasgow as the machines they had were newer. This appointment did not go so well – we found out cammy did have two holes and that he would require a heart op asap! I got a phone call on 24th september to say he was booked in for an op on 8 october – i cried so much worrying for my boy. I stayed overnight at the Glasgow hospital for sick children on 7th his dad brother and sister stayed at home in Edinburgh this was so hard! We were told there was accommodation on site but that we would need to wait until he was in the operating theatre before they could apply for this. It was a long nigjt i had to ensure cammy had no milk from 2am as he was getting taken at 9am. I walked about with him in a buggy the hospital provided for hrs. This was so hard! I waited on his dad meeting me at 1030 I cried so hard. We wandered about until about 1pm when we received a call that we had accommodation- we went along with all our stiff and waited on news about cammy. At 5pm we received a phone call to say the surgeon wanted to see us I cried all the way up to the hospital. They were pleased with how the op went and said we would see him soon. We seen him at 9pm 12 hrs from when I seen him last- my baby was covered in wires and so swollen. Cammy has recovered well from his operation although they did not manage to completely seal the 2nd hole so cannot rule out another op in the future. He started walking at 20 months and says some words. He’s doing exceptionally well at sign language. Cammy does not each much though loves his milk and seems to associate hunger with milk rather than food bit we keep trying every day. He is the most loving boy he is gorgeous very very clever. He goes to nursery 3 days a week and is so independent. He loves to share and play with his friends and they love to play with him too. I’ve heard from so many people how sorry they are he has ds and even at the hospital were told what he might not be able to do not what he might be able to do. My boy is amazing and I’m so proud he is ours. Cammys brother and sister adore him so much he’s really completed our family.